By Lloyd and the Raggy Team. 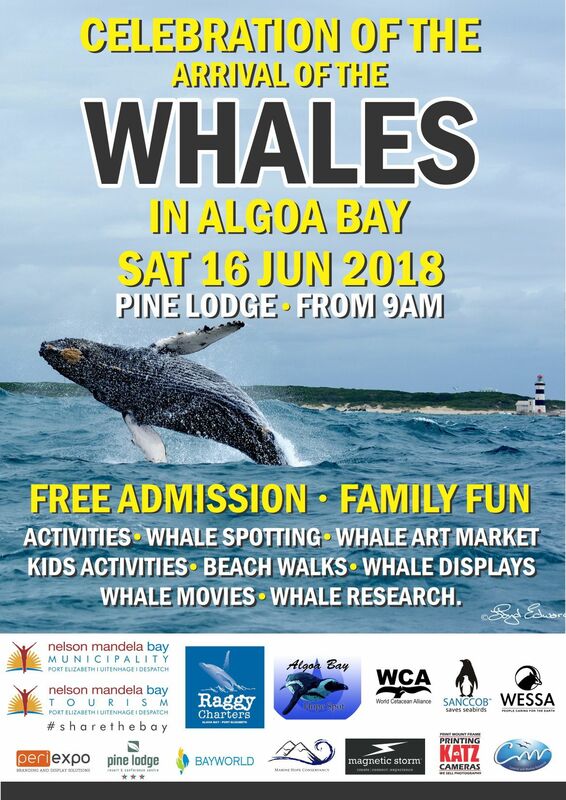 This year Raggy Charters, conservation projects, private companies and NGOs will be hosting the Celebrating the Whales Festival on Saturday 16th June 2018 from 9am at the Pine Lodge Resort, Algoa Bay. The aim of the festival is to bring the people of Port Elizabeth together and educate them about these magnificent animals and the importance of them to our oceans as well as to the economy of the Eastern Cape. He will talk about the value of the marine biodiversity we have in Algoa Bay and the importance of active citizenship in order to contribute to making Port Elizabeth the Metro we enjoy living in. Port Elizabeth also needs to be further developed as a “Green City”. 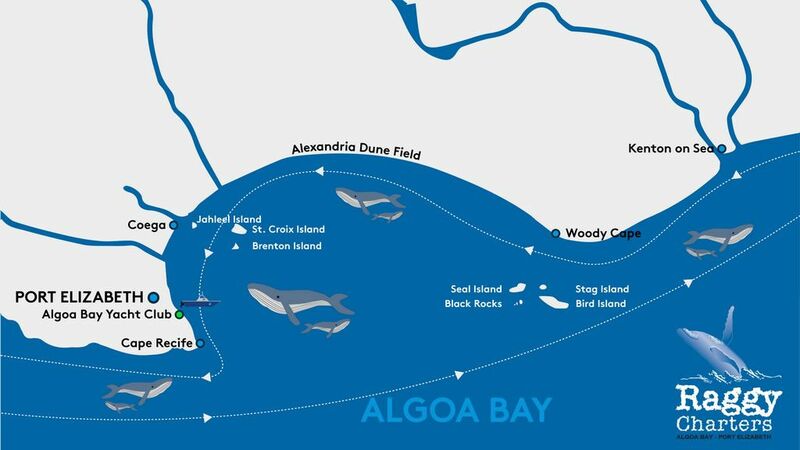 For the last two years, NMBT has been putting Algoa Bay on the map as a marine tourism destination, as a result of the marine wildlife that can be seen in the bay. This has contributed to a significant increase in tourism in the Metro, especially from the Asian market. NMBT was instrumental in the setting up of Algoa Bay as “The Bottlenose Dolphin Capital of the World”. Will present why Algoa Bay is an international Hope Spot, what it means for the bay and how locals can get involved in taking care of our environment. He will discuss the migration of the Humpback whales past Algoa Bay. It will track their incredible journey from their feeding grounds in the Southern Oceans to the East African Coastline. An estimated 7000 individuals pass Cape Recife from the 1st June. He will present award-winning pictures that he has been taking for the past 21 years aboard Raggy Charters cruises. Recent video footage (earlier that morning or the day before) from drones operated on one of our whale watching boats to be shown on a big screen at Pine Lodge. We looked at the Live Option feed but after consulting specialists, this seems far too complicated and fraught with potential problems. This also alleviates the problem of the sea being too rough on the day which will not allow a boat launch. We also will screen a brilliant video on the migration of the Humpbacks and them giving birth in Mozambique. The whale lecture and live video will be repeated at 11am and 1 pm. There will be a shop on the premises to serve coffee and pastries. There will be availability for lunch at The Island Restaurant. 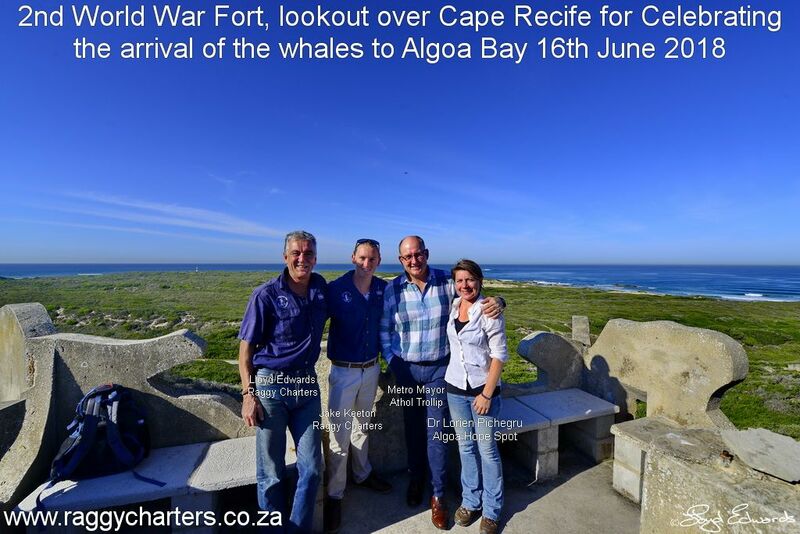 There will be tours running from Pine Lodge to the Second World War fort overlooking Cape Recife, an ideal vantage point to observe the Northern migration of the whales. There will be whale guides on hand to provide information and spot whales. Permits will be issued free of charge at Pine Lodge to enter the reserve, thanks to the Metro Beach Office. Participants will be met at the bottom of the road to the fort by members of the Dendrological (Tree) Society of the Eastern Cape. They will be escorted to the fort and taught a few indigenous trees en route. At Pine Lodge there will also be ongoing whale theme displays. Bayworld will show off some whale parts from their stores and the history of whaling. It will be a manned stall with someone there to explain the items on display. The Institute of Coastal and Marine Research at the Nelson Mandela University will be on hand to give an input on the latest cetacean and marine research in and around Algoa Bay. Staff/students will present some of their work in a collection of A3 posters that will create a really impressive photographic display. The Algoa Bay Hope Spot will highlight some of the reasons for the proclaiming of this accolade. There will be posters and a screen with revolving images on the hope spot. The Wildlife Society of SA will run a learner’s competition. Prizes will be available for whale watching cruises, diving courses and game safaris. WESSA will have their booklet “Know Your Bay” on sale. The World Cetacean Alliance will have a display on the plight and conservation of cetaceans around the world. They will also send out a strong message against the keeping of any cetaceans in captivity, except for rehabilitation purposes. Guided intertidal beach walks will be carried out by the Marine Hope Conservancy. There will be a display and sale of whale art and pottery. Only locally made art will be accepted and it must have whales as a theme. It will be coordinated by Michele’s Pottery and Mosaic Studio. Nelson Mandela University Fine Art students will create a whale artwork on the day. The students have done this at many events in Port Elizabeth. It is nice to engage the people and let them watch the artwork develop throughout the event. Raggy Charters will set up a photographic display of photos of whales and dolphins from Algoa Bay. Katz Camera World will be on site to take any orders. Local TV, radio stations and press will advertise and cover the festival. So far NMBT have organized 3 slots with Bay FM and Kingfisher FM and the Mayor has agreed to punt it on his Algoa FM slots. NMBT will be hosting the event on their website and assisting in advertising with Pole Ads at localities throughout the Metro. Periexpo has agreed to assist exhibitors and Magnetic Storm will supply a good PA system and technician. We are planning to screen a Humpback whale movie with POP UP CINEMA a week or so before the festival to give it some advertising and create awareness. SANCCOB will man a stall to promote their work and encourage people to visit the rehabilitation centre on the way back from viewing the whales. This great initiative is a forerunner to the Dolphin Carnival which will be held during 2019. With the community on board, this festival can only be a success. The World Cetacean Alliance’s broader plan with these kinds of festivals is to link the entire Humpback whale East African migration route, quite an amazing project! Durban is already on board and having a “Welcoming of the Whales Festival” on the 30th June. Please contact me on 084 55 222 77 if you have any questions or suggestions.